Does poor eyesight make you smarter? How does mental imagery work? How do we improve its function? What moderates the perception of time? How to change it? Do people have different levels of self-control or do they just experience temptation differently? What makes a good life? How do we study this? Many people lack intuitive grasp of numbers. How can we help them? Is there a tradeoff between episodic and associative memory? Does learning under alcohol influence occur if you forget whatever happened the last night? How do the players (game theory) get to know their payoffs? What’s up with our memory of dreams? What does GDP value? How can we do better? This is a list of the research I would do / fund if I had more time / money. Do let me know if you find this helpful, have any comments, or know answers to any of these questions! Vision is such an important sense for humans that a huge portion of the brain is devoted to visual processing—far more gray matter than is dedicated to any other sense. In blind people all this brain power would go to waste, but somehow an unsighted person’s brain rewires itself to connect auditory regions of the brain to the visual cortex. Nerves from muscles that control our eye movements, for example, connect to the brain’s hearing centers as well. These connections between visual and auditory regions of the brain become strengthened after losing sight. Also, some regions of cerebral cortex that border visual and auditory cortices—the left fusiform gyrus, for example—expand territory in blind people to make use of the idle circuitry in visual cortex. Well, why make this a dichotomy? It seems natural, that losing some eyesight during the critical period (i.e. childhood myopia), if left uncorrected, would cause some of the changes that we encounter in fully blind people. We already observe how the brain changes itself during the process of learning to read [5, 6, 7, 8, 9]! What are books (especially fictional)? They’re essentially a tool that translates persistent visual deprivation into narrative-driven visual hallucinations. So we would expect that the visual neurons get recruited in the parts of the brain responding to “imagination”. We would see this effect in people who spent non-trivial parts of their childhood having myopia and not wearing glasses. How do we make imagination vivid? How do we make hallucinations controlled? 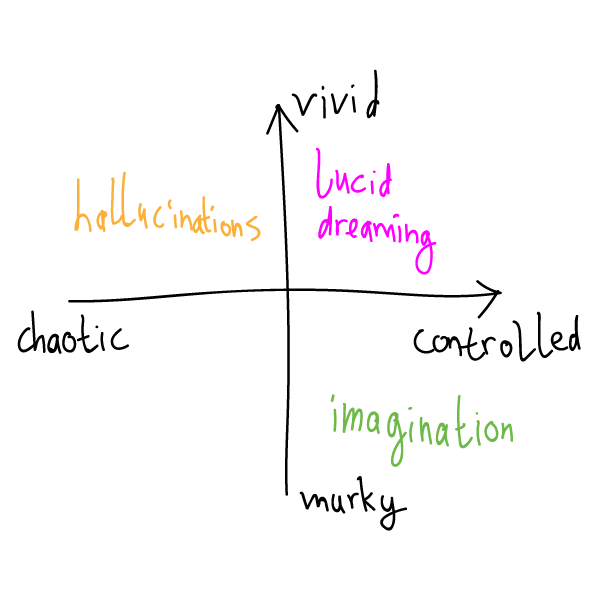 How do we make lucid dreaming as easy to enter as simply imagining something? To figure this out we would probably need to understand how mental imagery (the mind’s eye functions). I have very little idea where to start, tbh. It seems that imagination with closed eyes is more vivid. Why? Are tulpas, in a sense, controlled hallucinations? People who lose vision sometimes have Visual release hallucinations (Charles Bonnet syndrome). These apparently occur, because of the understimulation of the visual areas of the brain. So does “some loss of vision” result in “something like hallucinations”, i.e. improved imagination? And if imagination and hallucination are just opposite ends of the same spectrum, how do walk around it? He [Josh Waitzkin] goes on to talk about how step-by-step breakdown of techniques and repeated drilling can effectively “slow down time” since at a certain point you can strip away the unnecessary and consciously focus on a few highly specific details, the same way people in the middle of car crashes often report that in the life-or-death situation they have moments of hyper-focus and unusual reaction. He argues that level of focus can be cultivated when someone is highly trained in a discipline. Same works for me. If someone is more distressed than me (even if I’m really distressed! ), my distress evaporates instantly and I’m fully concentrated on helping the other person. I believe this is a more general observation: if somebody in your immediate vicinity really needs you, you will not be depressed. This explains why Africa doesn’t seem to have many depressed people, why men love war, and a bunch of other stuff. Note, that this doesn’t work if some abstract poor people somewhere need you! What do we know about happiness today? Not much. The academic literature seems to be mostly based on surveys which ask people how happy they are. This seems like an exceptionally bad way to study happiness. Non-academic literature suggests that maybe happiness either stays constant [1, 2] or declines , as civilization progresses. If you interact a lot with random people (not just your relatives, friends, classmates or co-workers), you might have noticed the absence of intuitive sense of numbers. Robin Hanson noticed this when he moved to GMU. Nick Huntington-Klein noticed this when he started doing freelance statistical consulting. This is probably at least part of the reason for why people stay poor while working full-time jobs; get into huge debts and can’t come out of them; think that 32% of Democrats are LGBT and 38% of Republicans earn >$250,000 per year; why science today is unable to make people save. Extraverted people seem to have better episodic memory, e.g. helping them in small talk, while intraverts have better associative memory, helping them to think globally. Is this observation valid? If yes, is there a fundamental tradeoff? I read somewhere that people who are unable to form new memories still retain some information non-consciously, e.g. if they are told a joke over and over they’ll find it a bit less funny each time even though they can’t remember hearing it. Not sure if this applies in cases of dementia. We remember dreams almost perfectly right after waking up and then the memory rapidly recedes and disappears completely, unless we write them down. This isn’t how normal memories function. So, why the difference? Although the phenomenon you mention is at least partly real (we have genuine memories of dreams, which we then forget), I suspect it might also be partly delusional, i.e., I wake up with the conviction that I dreamed a whole novel, but when I try to piece it together, I only have a couple of scenes. It may be, not that all the other chapters were written and then slipped from my memory, but that the chapters were never written in the first place and I only deluded myself into thinking I had a whole book. I’m not sure I agree about inputs. Personally, I don’t believe in value. I’m like a real estate agent. There is no such thing as value. There is only price. You can measure price. You can’t measure value; you can only estimate it by looking at prices. Price reflects what people think is important better than value. For example, if you can force someone do something without paying them, then that work has zero value, even if it is 100% vital. Look at motherhood. Without women giving birth to people, we’d all be dead. No moms would be worse than 1,000 hydrogen bombs going off. Odds are a few people might survive that. But, mothers aren’t paid, except token amounts in some wealthy socialist countries, so this critical activity counts for zip as far as economists are concerned. It seems that what GDP chiefly captures is how much consumer surplus were companies able to capture. What would be a better measure? Thanks to Guy Wilson for making me write this post.